Here at Engineering is Elementary we’re constantly brainstorming: “How ELSE can we support elementary teachers as they teach science and engineering?” Recently we decided to reinvest $200,000 from our project funds for a new round of professional development scholarships . . . and today we’re delighted to announce the names (below) of 100 elementary teachers from 24 states who will receive the first awards under the new program. “We use a rigorous process for evaluating candidates, and we had a strong response to the scholarship announcement—more than 200 applications—so the competition was keen,” says EiE scholarship coordinator Chantal Balesdent. Applicants were asked to submit examples of STEM lessons they currently teach, share ideas for integrating engineering with other subjects, and reflect on why engineering is important for elementary students. The selection process also screened for teacher leaders who show strong potential to share what they learn through the scholarship with their colleagues. Each scholarship includes tuition to attend a two-day EiE workshop at the Museum of Science, Boston. “We offer workshops on an ongoing basis all spring, so scholarship recipients can choose the training that best fits their schedule,” Balesdent says. Teachers will also receive a complete set of classroom materials: EiE Teacher Guide, a class set of storybooks, and a Materials Kit. Generous external support from corporate funders like Raytheon has already established that providing EiE professional development to teachers helps teachers AND their students; with so many schools facing tight budgets and tough decisions, we wanted to build on the momentum already created by the $2 million, five-year Raytheon initiative. Though many states have recently implemented new academic standards that put unprecedented emphasis on the "E" in STEM, engineering is a new subject for most elementary teachers, and most say they don’t feel well prepared to teach it. 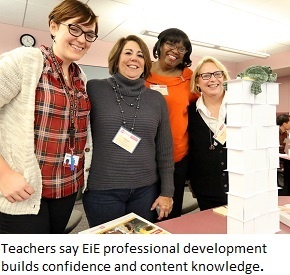 "We know that when you invest in high-quality STEM professional development for elementary teachers, it has a positive impact on their students,” says EiE director and Museum vice president Christine Cunningham. Past EiE scholarship programs have primarily supported educators in high-needs urban school districts, so some of the new scholarship were earmarked for teachers in rural districts. "It can be especially challenging for teachers in rural areas to access high-quality professional development," says Cunningham. Another set of scholarships were awarded to teachers whose classes include a high proportion of English Language Learners—a growing population in U.S. schools. If an EiE scholarship could benefit you and your school, watch this space, because we’ll announce a second round of scholarships later this spring!